The Mansion has just undergone a spectacular, privately funded 3-year renovation and reopened as the People’s House on July 14, 2018. More than a renewal of building and landscape, its purpose has been reimagined. It is now a place where visitors can glimpse Illinois history, witness its artistic side, and experience its long-heralded hospitality. 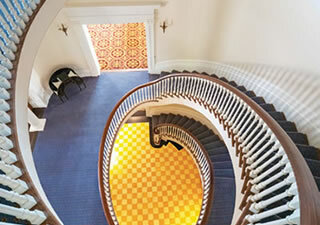 The Governor's Mansion is ADA accessible and is open for guided tours seven days a week from 1:00 PM to 4:00 PM. Tours for individuals and small groups are provided on a first-come, first-serve basis. Group tours for 15 or more can be booked through the Springfield Convention and Visitor's Bureau using their online reservation form. The Governor’s Mansion is an energy efficient landmark building recognized as a LEED Silver by the U.S. Green Building Council. Keep up to date on events and news from the Illinois Governor's Mansion by signing up for our newsletter. 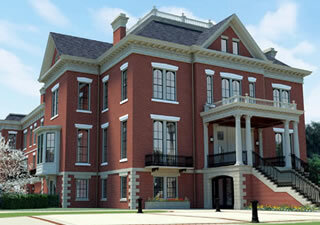 The Illinois Governor's Mansion invites visitors to expand educational opportunities for visitors. With professionally trained staff and volunteers available to host groups and assist in planning events outside of regular hours, the Mansion is also capable of hosting groups for programming outside of regular hours. ​Nestled between brick-paved streets and just blocks from the State Capitol, the Illinois Governor's Mansion is the third-oldest state governor's residence in the United States and the oldest gubernatorial residence in the Midwest. Learn more about how the People's House shaped Illinois History. The Illinois Executive Mansion has been home to Illinois governors and their families since 1855. It is the third oldest continuously occupied governor's mansion in the United States and was added to the National Register of Historic Places in 1976. 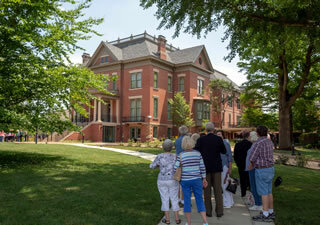 Join the Illinois Governor’s Mansion Association to help preserve this important landmark. Built in 1855, the Illinois Governor's Mansion is one of the oldest and most historic governor's mansions in the United States. The Mansion serves as the official residence of the Governor of Illinois, a symbol of leadership in state government, and a world-class house museum. The Governor's Mansion is open to the public for tours daily from 1:00 PM-4:00 PM. Walk-up tours will be accommodated on a first-come, first-served basis. The last walk up tour will depart at 4:00 PM. Enjoy online versions of current and past exhibitions of fine and decorative arts presented in the People's House featuring works by centuries of artists and craftspeople from the fine State of Illinois. Built in 1855, the Illinois Governor’s Mansion is one of the oldest and most historic governor’s mansions in the United States. The Mansion serves as the official residence of the Governor of Illinois, a symbol of leadership in state government, and a world-class house museum. Governor JB Pritzker and First Lady MK Pritzker welcome you to the People's House.